Our own good eating behavior our self is important for kids to see. When we include them in the creation of healthier family meals, kids will see and feel a direct correlation to how they feel. This will turn on their brainpower (both figuratively and literally) and fuel their body for excellent energy. It will empower them to make better choices when eating away from home. preservatives, food colorings, high fructose corn syrup, fake sugars, etc. Shop for foods that are filled with antioxidants and nutrients that will support our kids growing bodies and give them the energy they need for brainpower and physical activities. Children love to feel involved. If they are old enough, you can have them research 4-6 recipes that they would like to help you create. If they are younger, you can flip through recipes together. When they have a choice, it will help them feel more empowered. When going to the grocery store, include your children in your shopping experience. Give them a voice in what you buy. Spend the majority of time in the periphery of the grocery store (in the produce section) where all of the fresh foods are located. Engage in a dialogue about interesting looking fruits and veggies that are in season and discuss where the food comes from and how it is grown. Ask your kids if they’d like to try them at home and purchase them. Have kids help create the family dinner menu and write a list of what they like to eat for breakfast, lunch and dinner. A little prep and forethought goes a long way. Click here for a week at a glance menu template, you can use it to plan your week of meals and to help you shop and prepare. Purchase a fun lunch bag and portioned off containers such as Systema brand containers (my favorite) for easy lunch creations. Children love to be involved and learn new things in the kitchen. They like to emulate what adults and older siblings are doing. Giving children a voice and an actual hands on experienceencourages them to take responsibility for their health. It also makes them feel proud of themselves and involved in the meal-making process. 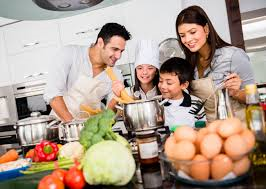 Younger kids can have simple jobs, like measuring and older kids can learn knife skills and actual cooking in pots and pans on a burner as well as in the oven. It is a rewarding experience when the meal they help to create tastes great! Add mild spices to your children’s diet. By adding fresh herbs like basil, oregano, dill, or other high antioxidant spices that are not too potent, can give your child an extra nutritional boost. A little cinnamon in their nut milk smoothie, So Delicious “yogurt” alternative, or steele cut oats adds a nice touch. For an easy breakfast or after school snack, try making smoothies. My favorite meal replacement shake is The Solutions 4 Shake. It comes in tasty Chocolate, Vanilla, Strawberry and Orange. If your children love fruit, but do not eat enough veggies you can hide the nutrient dense veggies in with the fruit and shake, just be mindful of the high sugar content in some fruits as fruit is still sugar. I like to add spinach and avocado, as adding in good fat to the diet is highly beneficial. Most sweet fruits will mask the taste of greens, which makes fruit smoothies a great way to “hide” greens and other nutrient dense vegetables that your child might not otherwise eat. You can also add nut butters for additional protein. Using coconut milk, almond milk or cashew milk as an alternative to cows milk is best. To me, cows milk clogs the pours, is not great for the digestive system, and is mucous forming. Another idea for a sweet treat is to blend a So Delicious Coconut yogurt with fresh or frozen strawberries, blueberries, or cherries, along with a sprinkle of ground flax, chia, or hemp seeds, and pour into a popsicle mold and freeze. Hint: Be mindful of the sugar content. I like to mix a plain coconut yogurt with flavored one. You can purchase the Chill Factor Brand slushy maker and turn the smoothie into what has a taste and texture close to soft serve. Be mindful of picky eaters as they will often hide their unwanted vegetable leftovers under other foods or merely smear them around the plate until mealtime is over. Serve vegetable entrees in separate “self-serve” bowls at the dinner table and have children serve themselves. This way your child can choose the amount they want on their plate, giving them some command over their meal portions. Be creative with vegetables. When my kids were young they liked broccoli, garlic, olive oil and melted cheese. Now that they are older they eat them with out the cheese. Flavor is key. I also make one to two trays of an array of roasted vegetables and they will eat what they like and take them as leftovers for school lunch. The time spent on food prep, especially, after school snacks, is time well spent. Precut your veggies and keep them in separate glass containers in the fridge. Chop carrots, celery, cucumbers, colorful peppers, radishes, along with other vegetables. These precut veggies can be kept ready-at-hand for quick snacks. Make or purchase healthy dips such as hummus and guacamole. While you are cutting the veggies, chop carrots, celery and onions and have them ready for soups and stews. These can also be purchased precut, but you will pay a premium. I buy the Mirepiox at Trader Joes as a weekly staple to save time. Implementing some of these tips and tricks into your home now will go a long way to building the structure and habits that will add up to lasting lifelong health. The idea is to make mealtimes tasty, nutritious, simple, and fun. Combining these elements can help build healthy habits that will last a lifetime! Linda Arrandt is an Integrative Nutrition Health Coach. She has been in the wellness field for over 25 years. She is also a Licensed Neuromuscular Massage Therapist and Certified Pilates Instructor. Linda is passionate about health & wellness and lifestyle. Linda believes that by getting to the root cause of illness by getting the gut healthy is a springboard for future health outcomes for children, adolescence and adults. Health is a family affair and what we place on the end of our forks is very important for a lifetime of health. Follow Linda on Instagram at simpleandwell. Her website is www.simpleandwell.net . Click on this link to find tasty and clean recipes. 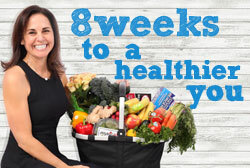 She believes that simple changes will lead you and your family to better levels of health together. “We are not talking about perfect, we are talking about better”. Here are some testimonials of people Linda has helped with lifestyle change.